Linear Actuators System for Theme Parks and Amusement Parks |Venture Mfg Co.
Nowadays, linear actuators are widely used in a vast range of applications. These devices are used in almost every second industrial application. Actuators have made their presence felt in almost every possible area of application. They are not only used industrial machinery and equipment, but also are being used increasingly theme parks and amusement parks. Venture Mfg. 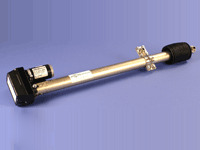 Co. is an experienced, and trusted manufacturer of linear actuators in the US. We manufacture and supply various linear actuators for amusement parks in desired specifications. There are several rides in an amusement park, which use linear motion. To execute linear motion, heavy duty linear actuators are used to a great extent. Particularly those rides that have vertical or horizontal movements make use of linear actuators. Different rides in an amusement park, including the Twister and Carousels use linear actuators. Thus, less number of mechanical parts are required in these rides. This helps reduce the risk and facilitates safe and smooth rides. The linear actuators in theme parks are used in the most unexpected applications of arts and entertainment industry. Virtual reality rides also make use of linear actuators. The movement of these actuators give you a realistic feeling of riding one of the above vehicles. Amusement parks or theme parks have a variety of machines or rides that are required to carry several visitors simultaneously. Thus, they are required to be capable of handling heavy loads. For this purpose, the linear actuators used should be strong enough to withstand heavy weights. 800 Series Acme Screw DC Actuators: The 800 series acme screw actuators are specially designed for heavy duty applications. These actuators are ideally used in those applications, which require high load bearing. The sturdy 800 series actuators are also capable to withstand unfriendly and varying environmental conditions. Thus, the heavy load bearing requirement of amusement or theme parks is fulfilled by these actuators. This makes them ideal for use in several rides and machines of a theme park. The electric linear actuators used in theme park rides require lesser infrastructure as compared to that required by hydraulic actuators. This helps save a lot of space, which can be used for other purposes. These actuators are known for quieter operation as compared to the other actuators. The servo motor of these actuators help provide accuracy and flexibility. Very little set-up is required for electric actuators. This helps reduce the reconfiguration time required. The electric linear actuators have a capability to perform at higher speeds up to 1.5 m/s (60 in/s). Use of electric linear actuators helps save energy. The efficiency of these actuators is 90%, whereas that of hydraulic actuators is only 50%. These linear actuators have a longer life. In addition to this, the electric linear actuators have high load ratings. The electric linear actuators require very less maintenance and servicing. Venture Mfg. Co. has a huge experience in providing the best quality electric linear actuators for various applications. We understand that the quality of linear actuators used in amusement parks is of utmost priority to deliver safe and optimal functioning. Thus, you can bank on us for high quality linear actuators. We can also get your actuator customized for specific applications.